The American Trends Panel is a nationally representative panel of randomly selected U.S. adults living in households. Respondents who self-identify as internet users (representing 89% of U.S. adults) participate in the panel via monthly self-administered web surveys, while those who do not use the internet participate via telephone or mail. The panel is being managed by Abt SRBI. Data in this report are drawn from the August 2014 wave of the American Trends Panel, conducted Aug. 11-Sept. 3, 2014, among 3,278 respondents (2,923 by web and 355 by mail). The margin of sampling error for the full sample of 3,278 respondents is plus or minus 2.3 percentage points. Of the 10,013 adults interviewed, 9,809 were invited to take part in the panel. A total of 5,338 agreed to participate and provided either a mailing address or an email address to which a welcome packet, a monetary incentive and future survey invitations could be sent. Panelists also receive a small monetary incentive after participating in each wave of the survey. 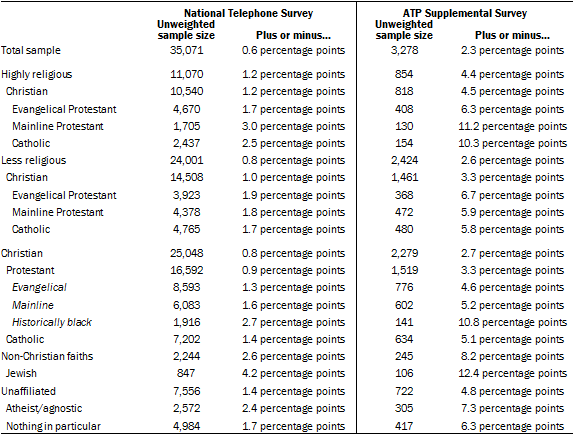 The ATP data were weighted in a multi-step process that begins with a base weight incorporating the respondents’ original survey selection probability and the fact that some panelists were subsampled for invitation to the panel. Next, an adjustment was made for the fact that the propensity to join the panel varied across different groups in the sample. The final step in the weighting uses an iterative technique that matches gender, age, education, race, Hispanic origin and region to parameters from the U.S. Census Bureau’s 2012 American Community Survey. Population density is weighted to match the 2010 U.S. Decennial Census. Telephone service is weighted to estimates of telephone coverage for 2014 that were projected from the July-December 2013 National Health Interview Survey. It also adjusts for party affiliation using an average of the three most recent (at the time) Pew Research Center general public telephone surveys, and for internet use using as a parameter a measure from the 2014 Political Polarization and Typology Survey. The Hispanic sample in the American Trends Panel is predominantly native born and English speaking. The web component of the August 2014 panel wave had a response rate of 62% (2,923 responses among 4,702 web-based individuals enrolled in the panel); the mail component had a response rate of 64% (355 responses among 559 non-web individuals enrolled in the panel). Taking account of the response rate for the 2014 Political Polarization and Typology Survey (10.6%), the cumulative response rate for the August 2014 ATP wave is 3.6%. Sampling errors and statistical tests of significance take into account the effect of weighting. Sample sizes and sampling errors for other subgroups are available upon request. In addition to sampling error, one should bear in mind that question wording and practical difficulties in conducting surveys can introduce error or bias into the findings of opinion polls.